Pagan’s Pole offers you a chance to experience the Aerial Arts: The Aerial Lyra (Hoop), Aerial Hammocks and The Trapeze. The Aerial Arts classes guarantee a unique and fun filled way to exercise. You will engage muscles that have probably not been used in years! These workshops are guaranteed to work your core muscles, tone your arms and help with those problem areas: the bum and tum! 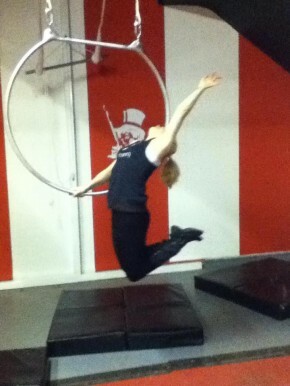 Our classes are suitable for the complete novice right through to the more advanced aerialist. You will be instructed through the basic positions, mounts and drops, through to combinations and transitions. Aerial classes can be scheduled to as and when the individual requires it or you can join a class. The private workshops are be held as hourly private lessons at a cost of £25. Aerial and Pole workshops can be used as a fantastic corporate bonding experience, or they can make an unusual and unique gift! (gift vouchers are available, please get in touch for a price quoted to your requirements).